She’s got one of the best voices in folk music and Debra Cowan, a singer of old songs, graced us with her talents once again at “Profiles in Folk.” Deb’s got a new album out that’s devoted to songs from the Helen Hartness Flanders Collection housed at Middlebury College in Vermont and the Library of Congress. In 1930, Flanders, the spouse of a U.S. senator, became involved in folk song collecting and for the next 30 years she and her assistants traveled throughout New England collecting, recording and transcribing thousands of folk songs. 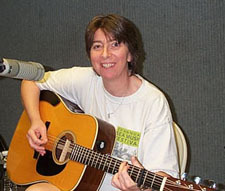 Nancy-Jean Ballard, a granddaughter of Mrs. Flanders, approached Debra in 2002 about the possibility of recording songs from the collection. The rest, as they say, is history. The album is “Dad’s Dinner Pail” and can be found on Falling Mountain Music. ebra will be doing several concerts in our broadcast area during the next several months. Some of them will feature guitarist Michael DeLalla, who accompanied Debra on the album and whose solo work is featured for a set at the end of Deb’s live session. The show concluded with a lengthy set dedicated to the memory of West Virginia guitarist Mitchell Burt (B.) Lilly, who died Sept. 18 at age 83. Together with brother Everett, B. comprised the Lilly Brothers, who migrated in 1952 to Massachusetts and became one of the first true bluegrass bands in New England at that time, influencing such players as Bill Keith, Joe Val, Peter Rowan and members of the Charles River Valley Boys. The Lilly Brothers, along with longtime compatriot and sidekick Don Stover, also a West Virginian, were inducted into the International Bluegrass Music Association’s Hall of Fame in 2002.